When you think eco-friendly, hybrid cars and solar energy may come to mind, but it doesn’t have to stop there! 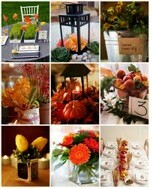 Why not continue this earthy trend and be eco-friendly, even for your wedding! Follow these steps and you can be earth friendly for every aspect of your wedding. Out with the white, in with the green! First, start off with your invitations. You can choose from 100% recycled paper, partially recycled paper, tree free paper, paper that can be planted to grow into flowers, or you can take the alternative route and go completely electronic. 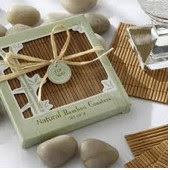 Next, are wedding favors where you can choose items that support local artisans instead of having something shipped, or provide an organic gift. There is a wide variety of organic gifts out there that range from small trees, seeds, bulbs, plants, organic chocolate and local honey. Another option is to purchase from a supplier that supports a charity, such as The National Arbor Day Foundation. Centerpieces can consist of flowers such as small perennials or baby bushes that your guests can later plant. If you would like to use a container of some sort to hold part of an arrangement, you can use containers or vases made from recycled glass or bamboo. Fruits and vegetables can also be used to help design. Flowers can be purchased that have been organically grown or you can grow your own flowers. It is also important to keep in mind that flowers can be reused in different parts of the wedding such as in the ceremony and then at the welcome table at the reception. Attire can also be earth friendly at your wedding. Brides can reuse a gown from a friend or family member. A dress can also be bought vintage or rented. However, being realistic, this idea of reusing a dress on your wedding day is not what every bride wants. If you want to purchase your own gown for your special day you can still be eco-friendly and have your gown made of fabrics such as hemp, organic cotton, linen, and silk. After your wedding, if you choose to, you can donate your dress to a charitable organization. Being earth friendly is a new trend and can be incorporated into every aspect of your life, particularly your wedding. Maybe an entirely eco-friendly wedding isn't what you had in mind, but by applying certain aspects, you can make a difference! Go Green!